June was masculine cards in stamp club. My stamp club ladies swap cards each month and we follow a theme. I created this card for stamp club based on this card I saw on Pinterest by Jade Boteler. I liked the sepia tone look of it. This world map background stamp teams very well with the new Traveler stamp set. You can purchase all supplies on my online ordering website. Moving stuff is progressing. We moved my daughter's stuff in to her house at college. She pretty much just has some clothing left here. It was hard for her to have her stuff 3 hours away at school. It was odd to see some of our furniture now ensconsed in her college house. It is a typical run down college house. Or as her boyfriend called it, "a dump". There are some nice hardwood floors in the living room and dining room. It definitely has more space than her tiny on campus apartment from last year. Everyone has their own bedroom. Something she was used to having at home but hasn't had at college for the last 2 years. I know she will enjoy having her own space again. We have had a couple of showings on our house. It is odd to think about some strangers wandering through our house and wondering what they think. My daughter said too bad we can't plant an audio recorder and hear what they are saying. Hah! I saw some cards floating around the stamping world with the tickets used with this Ferris Wheel stamp set from the Feeling Sentimental stamp set. I just had to put my "spin" on it! This stamp set makes great masculine cards! I'm always in need of those. Lots of males in my life and household. And best yet, you can get this set for FREE during Sale-a-bration! Just go to my website here to place your order for $50 or more product and throw this stamp set in your cart for FREE! Hurry, Sale-a-bration ends March 22! March is a crazy month for me! Both of my boys have birthdays in March, it's the wrap of Sale-a-bration and my youngest has his gymnastics meets wrapping up. Time is flying! My son Sam, was invited to a birthday party for his friend Preston. He saw a trick his brother played on his cousin and he's been dying to try it out. He wrapped a big box with gfit wrap. Inside that box was a smaller box with gift wrap, and inside that was a third box with gift wrap. When the recipient gets to the third box they may be getting a little frustrated. In the third box is an empty bag and there is nothing else to open. That's when Sam pulls out a card with money in it and says, "Here you go!" I made this card to give to Preston. It's simple but masculine. I used the new Adorning Accents Edgelets. Love this fancy edge! Well, it's Monday so I have to dash to work. The kids are off today. Must be nice! Tomorrow Sale-a-bration starts! Yippee! My favorite part of the Stampin' Up! year! I'm having a Sale-a-bration Open House on Sunday, January 29. If you are local to the Twin Cities and would like to come by it will be from 2:00-5:00. Just contact me at kathleen@myhappystampingplace.com or at 952-226-2190 to let me know you're coming. 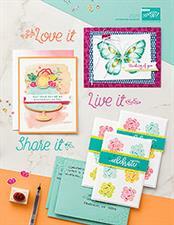 Each new catalog I participate in a WOW card swap with a group of Stampin' Up! demonstrators. It's kind of tricky coming up with a WOW masculine card but I made an attempt with this one. I started with a Monday Mojo Sketch, used some new masculine dp called Nautical Expedition from the new Summer mini which comes out May 1 and a new stamp set from the mini called The Open Sea. The red and white baker's twine is from the mini too. I have a busy weekend ahead. We have the Regional Science Fair with my youngest, Sam and a weekend soccer tournament for my middle son, Nick. I know the weekend is going to fly by! I wanted to make a masculine card for a Stampin' Up! party I did at Cindy's house Wednesday night. I grabbed my Beware of Pirates stamp set. Oddly enough, this is one of the first stamp sets I purchased out of the catalog last year. Perhaps because I have two tween boys and this definitely has a masculine feel to it. I embossed the ship from this set on Confetti white cardstock with Versamarke and Winter White embossing powder. I brayered More Mustand on the top part of the image and then brayered Not Quite Navy on the bottom. Then I went back over the whole thing with the More Mustard on the brayer. 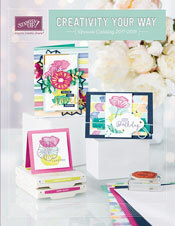 the background is textured with the awesome square lattice embossing folder from Summer mini catalog. This is my kid's first day of vacation. As of 11:30 I haven't laid eyes on my 16 year old daughter and my 10 and 12 year old boys have been getting along! Yippee! Usually we have a rough start to summer with them getting used to being around each other so much. I hope this is a sign of things to come. I got my pre-order of Stampin' Up! goodies. I plan to do some stamping this weekend and have some show and tell for ya! Masculine cards are something many of us papercrafters struggle with. Most of us love the bling, the ribbon, the flowers, the ruffles. You have to throw that all away when you're making a masculine card. When I make a card for a guy I think earth tones, texture, and low frills. With father's day coming up we decided to go with a masculine theme in one of my card clubs for the swaps they do with each other. I decided to make a masculine card for one of the three projects we make in card club this month too. The tree is from the set Thoughts and Prayers. This set is more of a sympathy stamp set but I thought the tree would lend itself nicely for a father's day card. I made it a little more generic than that with the sentiment "from the heart" from the Holidays and Wishes greeting set. I paper pierced around the perimeter of the kraft cardstock. The vanilla piece is roughed up with the distressing tool. This is my kid's first day of summer today. It's going pretty good so far. No major fights. My daughter(who had the chicken pocks) actually went to babysit today. Her pocks have scabbed over and she's on the mend. Yippee!